This large romantic room provides a serene view of the pond, carriage house and wooded acreage beyond. A vaulted ceiling, two window seats, plantation shutters, and paddle fan add to the charm of this room. 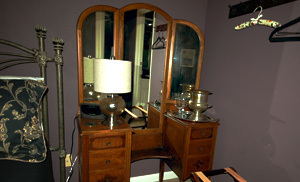 It has a lovely king-sized iron bed and antique furnishings with a nice sitting area. A TV and more are provided. You will enjoy a private bath with a beautiful spacious shower with rain head. See what is available in all rooms. 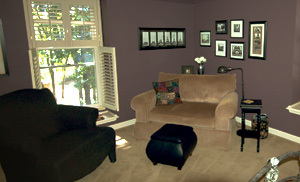 Note: This room can accommodate three people using a twin sofa bed. 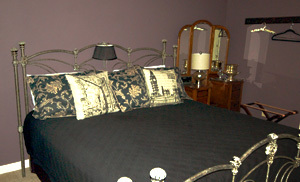 An additional charge of $45.00 for 3rd person per night. Smoking in rooms will result in an addition of one full room charge.